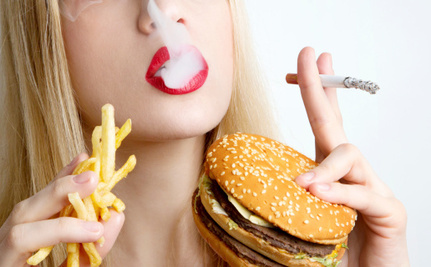 Care2 Causes | Can Eating Meat Be Just As Bad For You As Smoking? Can changing what you eat and what you do influence the likelihood of your risk for getting cancer? With a new year starting, many of us may be making pledges to improve our health, whether by quitting smoking or cutting down on our consumption of beer, wine or meat. A review published at the end of 2013 that analyzes food supply data from the United Nations’ Food and Agriculture Organization (FAO) provides some motivation for sticking to your newly-made resolutions. According to this study, eating a meat-rich diet could be as bad for you as smoking or drinking. The study was published in an online, open-access journal, Nutrients, and was undertaken by William B. Grant of the Sunlight, Nutrition and Health Research Center in northern Califronia. It’s an ecological study that draws on data collected by others (in this case, the FAO) about populations, but without knowing specifics about the people studied (i.e., if they had any medical conditions, or if there were environmental factors, that might have made them more susceptible to cancer). Various types of cancer (including lung, prostate, breast, stomach and liver, among others) among men and women in 157 countries were considered. Data from 87 of those countries was focused on, as these countries (Japan, the U.S.) are said to have “high-quality data” about health and diet. Based on the notion that there is “generally a lag of up to 20 years between dietary changes and peak cancer rates,” the study looks at data that goes back to 1980. The author found that smoking and consumption of animal products (meat, fish, milk and eggs) were correlated with “over half of the cancer incidence rates, with alcoholic beverage supply explaining a smaller amount.” For men, smoking was found to play more of a role in increasing cancer risk; for women, eating animal products played the greatest role. Additional research that takes factors such as people’s medical histories and lifestyle choices into account is needed to confirm that a diet rich in animal products is as bad for your health as smoking is. Why Would Eating Meat Increase Cancer Risk? Other research has tied eating meat to increased cancer risk. Research published in March found that eating a lot of processed meat (ham, bacon, sausages, burgers) in particular was associated with a higher risk of dying from cancer and heart disease. In October, researchers from the University of Southern California reported that eating red and processed meat was significantly associated with a greater risk for colorectal cancer in people with a certain genetic mutation. In the United States, the early 1980s saw a push for eating fewer carbohydrates and increasing protein intake, as called for by the Scarsdale diet and, in the 1990s, the Atkins diet. That is, even while meat consumption has been linked to heart disease and to being at a higher risk for total, cardiovascular and cancer mortality, people have had their reasons to increase their meat intake. If you must eat animal products, eating meat that is minimally processed and from antibiotic-free animals who’ve been raised using sustainable methods and in humane conditions could be a way to minimize any risks. As the Nutrients study suggests, eliminating it from your diet and going meatless is a very good way to get your 2014 off to a very healthy start. Sure eating meat can be bad for you. It could be too much that you're eating. Despite what the study says, I can't possibly in my right mind believe that eating meat is just as unhealthy for you as SMOKING! That is just absurd. Humans have been eating meat for over 1.5 million years. Eating meat was an important part in our evolutionary process. We wouldn't be the humans that we are today if it wasn't for eating meat. ...Eating meat is just as unhealthy as drinking alcohol or SMOKING? That is the most ridiculous thing I have ever heard.